Jenn was always fascinated by birds, and was around them from a very young age, thanks to a very good friend who had a flock of ever-changing budgies. In middle school Jenn rehabilitated a young American Robin, who she named Conant, that had been attacked by a friend's cat. Her interest in birds grew much deeper after that initial spiritual connection had been forged. When she was fifteen, she finally got her first pet bird, a cobalt pied English budgie she named Caeli, which means Latin for sky. Things most definitely did not end there. Caeli was soon followed by two more English budgies, and then a peach-fronted conure, Peaches. Peaches stole Jenn's heart, and still has it to this day over seventeen years later. Many other birds have passed through Jenn's flock, including other parakeets, neophemas, conures, a cockatiel, and a canary. Our current birds include: Rowdy, an 10 year old male yellow-naped Amazon, Cutie, a 10 yr old american budgie, and Moss and Prairie, 3 year old american budgie siblings. In addition to living with all of these psitacines, Jenn worked professionally at a pet bird store for eight years, and worked with hundreds of different birds of dozens of different species. In the store environment Jenn learned alot about behavior from interacting with so many birds, and from her more experienced peers. This is also where Jenn learned how to groom parrots and other birds. Jenn has groomed hundreds of birds, handfed many others, counseled countless pet bird owners on proper bird selection, avian nutrition, "problem behaviors", cage selection, toy selections, and training, as well as many other subjects. Jenn took in a few unwanted birds while she worked at the store and helped to find them sucessful homes. She also worked briefly as a veterinary assitant in an avian veterinarian's office where she came in contact with birds needing surgery for injuries and health problems, grooming, general well bird check-ups and good advice. Jenn has attended seminars with Dr. Susan Freidman, Robin Shewokis, Mattie Sue Athan, and has also spent a few days with the highly respected Dr. Irene Pepperberg. 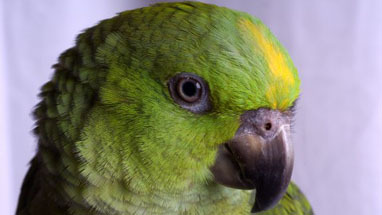 She was interviewed for a Bird Talk article on budgerigars in 2005, and was featured in a story on bird grooming in the 2009 issue of Birds USA. Jenn also has extensive experience with dogs and rabbits, having been involved in these fields for many years also. Jenn has attended a number of seminars on positive reward-based training, read dozens of books, magazines and articles, and constantly strives to increase her knowledge of all animals by attending seminars, subscribing to many topical newsletters, magazines and groups, and by networking with peers, with a large focus on canine and avian species. In her free time Jenn enjoys being an amateur bird watcher, being outside, spending time training and having fun with her animals, photography, traveling, writing, and reading. Jenn is responsible for all bird grooming, consults, training, seminars and classes.